The AME1400 is a low air loss mattress overlay system that revolutionizes the overlay market by providing customized comfort and optimal skin protection! The AME1400 low air loss systems with the ultimate skin protection of a ROHO® HIGH PROFILE® Cushion in the heel area to create an optimal environment for skin healing and protection. The AME1400 is so versatile! It sets up in minutes on top of any existing mattress – no need to store mattresses! The ROHO HIGH PROFILE cushion in the heel area, our HealFloat™ feature, protects heels and creates an optimal environment for wound healing. Simply remove the cushion to use on any chair for added skin protection. System Lock: Helps to prevent accidental adjustments, and automatically resets the system in case of power failure. HealFloat™: ROHO HIGH PROFILE Cushion inserted in the heel area creates an optimal environment for skin healing and protection. 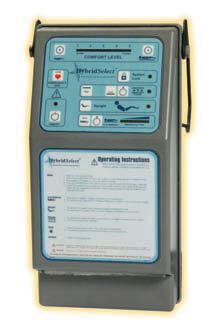 Pulsation (alternating pressure): Provides two cycle settings that readjust the system to ensure patient comfort. This powerful low-air-loss system gives you advanced, easy-to-operate settings in a simple overlay. With the help of AME1400, it’s never been this easy to protect patients’ skin and keep them comfortable. Control unit provides constant inflation and can be adjusted to suit your needs. Adjustable control unit settings for optimum comfort. High grade materials provide long product life even if patient’s needs change. 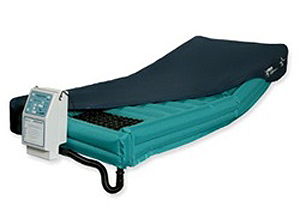 To aid in the placement and maneuvering of the patient, the control unit is equipped with a Firm Mattress Mode. The Firm Mattress Mode will fully inflate the mattress making it firm for easy positioning. The Firm Mattress Mode will automatically terminate when the time displayed on the keypad has expired. This control unit is equipped with the Pulsate Mode. When selected, the control unit will continuously readjust the system pressure (proportional to the Comfort Level setting). Change in pressure is gradual to ensure maximum patient comfort. Fits on top of existing mattress. No need to store mattress! Easy-to-adjust control unit provides constant inflation. Adjustable control settings provide optimum comfort. Mattress overlay and cushion are easy to clean. Durable, high-grade materials provide long product life. AME1400 Mattress Replacement System . Mattress Configurations Individual baffles divided into 3 sections; head, seat and foot. Integrated side air bolsters. ROHO HIGH PROFILE cushion in foot section. Available Fits most standard bed frames. Two-Year Limited Warranty on removable HIGH PROFILE cushion.